The fitness industry is largely built and survives on the perpetuation of fallacy and dogma. Be it the high priestess of charlatans, Tracy Anderson, spewing her downright insane - albeit comical – methodology or any of the infinite supplement companies promising extreme results in 30 days or less!, most of the readily available information pertaining to health and fitness is a scam. Powerlifting, while subject to less of the mainstream B.S., has its own set of equally ludicrous myths and, to be blunt, I’m sick of these fairy tales and the pure ignorance that sustains them. In an effort to eliminate these myths once and for all, in this article I’m going to de-bunk 4 of the most common fallacies perpetuating powerlifting today. While keyboard warriors world-wide will undoubtedly rise up in arms over my claims, I guarantee the information here-in will not only enhance your overall knowledge but will provide you with the opportunity to achieve your ultimate strength potential. Old school powerlifting dogma preaches that in order to be strong you need to be big. As big as humanly possible. It doesn’t matter what the weight consists of (muscle or fat) nor how it’s gained…if you’re getting bigger you’re getting better. While many lifters still subscribe to this train of thought, it couldn’t be further from the truth. As powerlifting progresses and newer methodologies creep their way into the limelight, we’re seeing, more and more, that getting as big as humanly possible is not only unnecessary…it’s likely detrimental. Health risks aside (there are too many to discuss), gaining inordinate amounts of weight will hinder your training and performance. I once saw a lifter, a great lifter mind you, who was so big and de-conditioned that he missed his 1st squat attempt, not because he couldn’t lift the weight, but because he gassed out walking to the squat rack! The worst part was he didn’t even get the chance to lift. He was so slow in getting to the rack that by the time he arrived it was well past his turn. In essence, this guy spent years getting as big as possible in order to lift heavier weight but, when it mattered most, his weight kept him from lifting. To be clear, I’m not implying that all weight gain is bad– that would be ridiculous. No one could [intelligently] argue against the importance of progressively increasing bodyweight through the addition of muscle mass, bone density, and even controlled amounts of fat. I am, however, saying that weight gain, regardless of composition, as quickly as possible for extended periods of time will wreak havoc on your health, training, and performance. By all means, pack on as much muscle as possible but the days of using bulking as a valid excuse to become a fat mess are over and done with. Fat and strong is a thing of the past. Lean and strong is the future of powerlifting. I recently pulled 485lbs at a bodyweight of 132lbs (3.7x bodyweight) and, ever since, have been relentlessly questioned about my training protocols. Upon learning that I Squat and Deadlift on the same day (twice per week, mind you) most people look at me, flabbergasted. The terms CNS fatigue and overtraining have been tossed around for years without the slightest inkling as to what they truly mean. While many coaches and keyboard warriors relish the opportunity to tell of the perils associated with CNS fatigue, the reality is most people never come anywhere close to being overtrained. Largely based on rough observations and subsequent folklore, many in the fitness industry have come to believe heavy lifting automatically leads to CNS fatigue. But what if that’s not how it works? What if it’s a glorified myth? To dig a little deeper, what if this myth led you to believe that you’ve been overtrained even when you were perfectly fine…or perhaps just a bit tired? We’ve all heard of the placebo effect and understand something as benign as a sugar pill can drastically change our perception of pain, discomfort, and fatigue so long as we believe it will. In accordance, is it possible the onset of CNS fatigue (at least as common as it’s made out to be) is just a placebo? I believe most trainees experiencing symptoms of what they assume to be CNS fatigue are, for lack of a better phrase, making it up in their head. Time and time again they’ve been taught that consistent heavy lifting will cause them to overtrain. They’ve been told that Squatting and Deadlifting on the same day will most assuredly result in CNS fatigue and inevitably destroy all of their progress. In essence, they’ve been conditioned to believe that training over a certain threshold (which has yet to be defined and varies with each individual) will push them into overtraining. As a result, an unprecedented fear of CNS fatigue has taken over the powerlifting community. Keep in mind, I’m not implying overtraining doesn’t exist. I am, however, saying that Squatting and Deadlifting on the same day is not enough to put you in an overtrained state. Sure, you might be tired and fatigued but that doesn’t mean you’re overtrained…it just means you lifted heavy weight and need to eat, sleep, and recover. It’s not magic; it’s common sense. Psychological state and emotional arousal strongly correlate to CNS fatigue so pay attention because this section is a twofer. I used to be that guy. You know, the guy who snorts an ammonia cap, screams, gets slapped in the face, and slams his head into the wall before every attempt…even the warm-ups. Yea. I was that idiot. I trained like that for a long time until I spent several months interning under Louie Simmons at Westside Barbell. It was there, of all places, that I learned the importance of zen lifting and keeping psychological and emotional arousal to a minimum. See, psyching yourself up for a lift initiates a stress response in the body. This stress excites the nervous system and uses a ton of energy. While psyching yourself up may or may not lead to a stronger lift, in the long-term (think several minutes up to a few days afterward) this enormous stress response can leave you tired, fatigued, and possibly even weaker. Now think about creating that exact same stress response, day in and day out, for months on end in conjunction with heavy training. Whether or not this would lead to true overtraining is unclear, but it will fatigue the hell out of you and possibly impede your progress. So how should this information impact your training? If you want to freak out and bash your face against the wall, that’s fine but save it for competition. Plain and simple, there’s no reason to scream, slap yourself (or others), or snort ammonia in the gym. It’s a waste of time and energy. 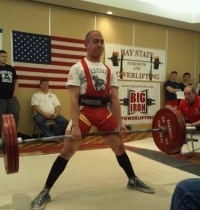 Personally, I never get psyched up for a lift…not even during competition. In fact, right before taking an attempt my buddies and I tell each other jokes. While other lifters are bleeding out the eyeballs and screaming bloody murder, we relax, smile, and have a good laugh. Not only does it spare the CNS and keep us fresh throughout the competition but, more importantly, we have a hell of a lot of fun. The high-bar low-bar debate is as old as powerlifting itself so it’s time the controversy came to an end. To give you an in-depth overview of what I consider optimal, high-bar or low-bar, take a gander at the brief video clip below taken from my 2-hour Elite Performance Squat Seminar. Simply put, neither option is inherently better or worse than the other. If you squat better high-bar then squat high-bar. If you squat better low-bar then squat low-bar. As you saw in the video above, I err towards more of a high-bar approach but, realistically, it’s more moderate than anything else. So how do you know which bar position is optimal for you? Play around with both and use whatever feels best. We’re all built and move differently from one another so what works for you might not work for me and vice versa. The most important component is finding what works for your individual needs, which is exactly what I outline how to do in my Elite Performance Squat Seminar. For 2-hours straight I discuss everything from self assessments, to an in-depth technique analysis, to progressions & variations, and I even devote an entire section to programming considerations. Plain and simple, this is the best resource on the market designed to teach you how to squat more than you ever thought possible in the least amount of time. For this week it’s on sale at 50% off the standard price. If you want to download your discounted copy of The Elite Performance Squat Seminar click the link below. I hope you enjoyed this article and were able to take away at least one piece of practical information. Powerlifting is truly one of the world’s greatest sports and together we can de-bunk the myths and fallacies perpetuating the industry to help thousands upon thousands of people achieve their ultimate goals.